From the north: Take I-55 south to Exit 104, take ramp (right) onto I-220. At Exit 1A, take ramp (right) onto U.S. 80. Turn left onto John R. Lynch Street and follow to campus. From the south: Take I-55 north to Exit 92B, turn right onto ramp. At Exit 92C, keep left to stay on ramp onto I-20 west. At Exit 42B, turn right onto ramp and bear right onto Ellis Avenue. Take right onto John R. Lynch Street and follow to campus. From the east: Take I-20 west to Exit 42A, take ramp (right) and bear right onto Ellis Avenue. Take right onto John R. Lynch Street and follow to campus. From the west: Take I-20 east to Exit 41, take ramp onto I-220. At Exit 1A, take ramp (right) onto U.S. 80. Turn left onto John R. Lynch Street and follow to campus. Jackson-Evers International Airport is served by eight commercial airlines: Atlantic Southeast Airlines, American Eagle, Continental Express, Comair, Delta Air Lines, Northwest Airlines, Southwest Airlines and US Airways Express. Rental car service is available at the airport through Avis, Budget, Enterprise, Hertz and National. Allow approximately 20 minutes driving time from the airport to Jackson State University. Jackson is served by Greyhound Bus Lines, located at 300 W. Capitol St., just minutes from the campus. Visitors are not required to purchase a University decal but shall display a visitor’s permit. 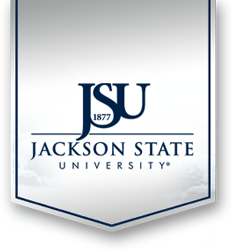 Visitor’s permits are available at the JSU Department of Public Safety Office. Visitors are required to abide by all parking and driving regulations. For more information, call JSU Public Safety at (601) 979-2580.